Every life must come to an end, but if our loved ones inspire us to greater things, then they need not "die." Natalie passed, but she did not die. She will live on through me, and through all those she affected, forever. After 13 years, my first child is gone. Natalie passed this morning after experiencing labored breathing and eventually respiratory arrest yesterday evening. Her life ended on our terms -- peaceful and filled with love -- rather than gasping for air when we first arrived at the ER last night. For 13 years, I've woken up to Natalie giving me a lick on the face (or as she got older, me waking her up with the pat on the head). 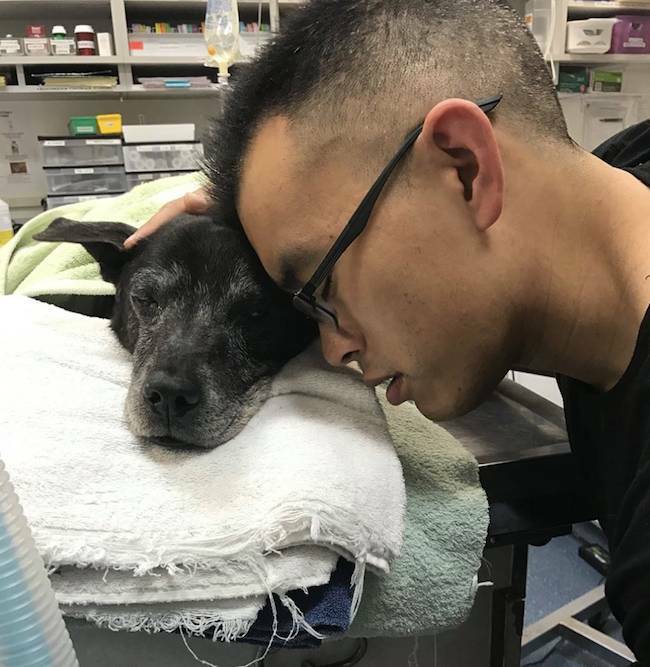 For 13 years, we've played ball and chase and gone on walks together, walks where my baby girl was so focused on me (she loved me more than she loved life itself) that she'd sometimes walk into walls while looking up at me, as if to say, "Papa, I'm so glad we're here together, and I wouldn't want to be anywhere else in the world but here with you." For 13 years, Nat taught me the meaning of compassion, of patience, of recovery, and of hope.... as she first recovered from severe trauma (Allie, do you remember the scars that covered her body when we first met her when volunteering at the pound, rescued from a probable dog fighting ring?) to become a joyful pup who'd play with me at the University of Chicago quad.... then later showed incredible resilience in walking despite severely arthritic back limbs, still plugging along to sniff and explore and yes, steal food from her papa and siblings, even when she hardly had the strength to stand. For 13 years, Natalie was my best friend and my greatest teacher. And in the beauty of our relationship, I realized the potential for all humankind: to treat our animal brethren as beloved friends, rather than objects for us to use and abuse. And now, after 13 years, I must move on. I'm still trying to imagine life without my little girl. Her barks, the funny way she licked her lips, her clumsy trot when we ran through hallways together... every little quirk still feels so real, so alive. But I know I have an incredible community and family to support me as I learn to forge a new path. Natalie leaves behind two brothers, Oliver and Joan, and one sister, Lisa, along with auntie Priya, who became a mom to her over the past few years. I hope to share more about what a special dog Natalie was, especially for those of you who only knew her in her latter years, because she was an incredible, brave, and brilliant soul who fully lived her life. A memorial service will be planned for later this week. In the meantime, thank you all for your support. Every life must come to an end, but if our loved ones inspire us to greater things, then they need not "die." Natalie passed, but she did not die. She will live on through me, and through all those she affected, forever. And while I cry many tears today, I center myself on gratitude and love -- gratitude and love for 13 years I would not have chosen to live with anyone else in the world. Thank you, Nat. I miss you terribly already. And I promise I will do everything I can, for you, to make the world a better place. P.S. In lieu of flowers, cards, or gifts, please consider becoming a member of the DxE network. Through the end of September, a generous donor will give us $100 for every new member, and that money will go to saving more animals just like Natalie. It's the only proper way I can remember such a beautiful soul.